Kuwait National Cinema Company (KNCC), a leading entertainment company in Kuwait, is rolling out its rebranded Cinescape across all its locations. Coinciding with the rebrand roll-out, KNCC is opening a new multiplex at Al Kout Mall, which was revealed during an inauguration ceremony. This marks a strategic milestone for KNCC not only for its rebrand, but also as part of its plans for further expansion as it cements its key position as the premium entertainment company in the Kuwait and wider GCC. Commenting on the rebranding, KNCC business development manager Khaled Issam Al Marzouq said that the launch of the new brand embodies KNCC’s strategy of improving its services and keeping pace with the latest developments in the global entertainment industry. This, he added, is particularly evident in the company’s delivery of the latest screening innovations, offering cinema viewers sublime moviegoing experiences packed with enjoyment and thrill. “Kuwait National Cinema Company has come a long way since its establishment in 1954 and is now the region's leading provider of entertainment, and particularly cinematic offerings,” Al Marzouq said. “Over the years, the company has upheld its values of catering to all ages and tastes, while also respecting local customs and traditions when it comes to the movie-choosing process. Furthermore, KNCC boasts a unique set of theatres of an unparalleled cutting-edge technology and unique design”. Cinescape Al Kout Mall is the latest addition to a host of Cinescape cinemas spread throughout Kuwait. Enriching the entertainment offering of Al Kout Mall, in Fahaheel, the new multiplex offers nine new state-of-the-art theatres, with seating of 1,586 combined, including premium choices for maximum convenience and luxury, all featuring an extraordinary design with the utilization of the most developed cinematic technologies, including IMAX with Laser and 4DX. Moreover, 17points of sale and nine self-payment devices have been set up for an easier and smoother payment service. Cinescape Al Kout Mall will also see the launch of an unprecedented service in Kuwait, allowing visitors to pre-order their choice of food and beverage online. Not having to stand in long queues anymore, the visitors will enjoy faster entry into the cinema. “Kuwait National Cinema Company is making significant investment to enhance the movie-going experience, with plans to increase the number of its cinemas to more than 105across the whole of Kuwait by 2022. All of our theatres will be equipped with cutting-edge designs and technology for an innovative experience that exceeds visitors’ expectations” Al Marzouq concluded. 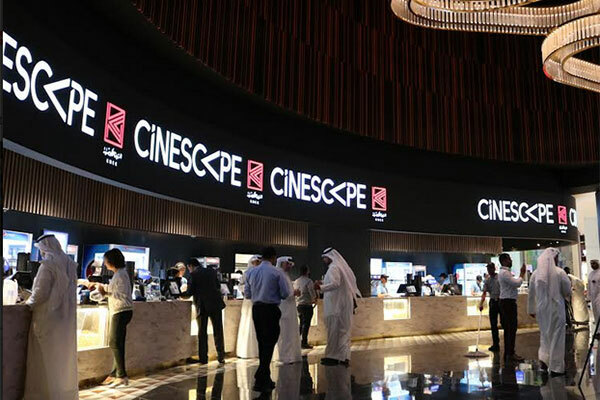 Asserting its status as the entertainment destination of choice in Kuwait, the company is redeveloping a number of its main Cinescape cinemas, equipping them with the latest audiovisual technologies. One of those, Dolby Cinema, will see the introduction of the laser-based Dolby Vision technology as well as Dolby Atmos surround sound, and is expected to open in the final quarter of the current year in 360 Mall.